My wife and I enjoy traveling and spending time at our camp on a lake in Maine. Sharing the beauty and wonders of Maine is our passion. 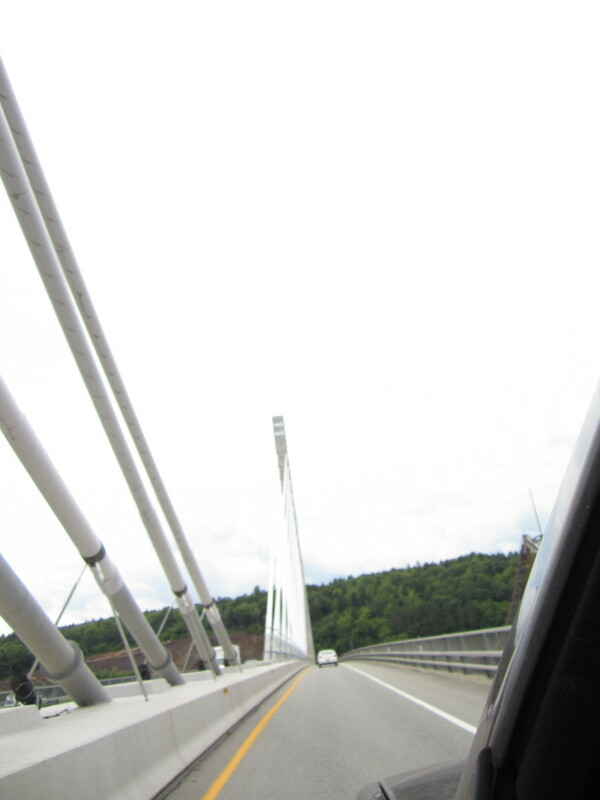 Like many, I regularly cross the Penobscot Narrows Bridge on my way to or from our camp in Maine. We race across it to get from one point to another. The heart-racing height, 135 feet above the river, and the expansive views of the surrounding landscape compete for my attention while I drive. On occasion, my wife and I slow down and stop at the viewing areas to marvel at this engineering feat and to enjoy the views. Every so often, we make the bridge and nearby Fort Knox a destination for the afternoon. Life in Maine is all about slowing down and appreciating the world around you. 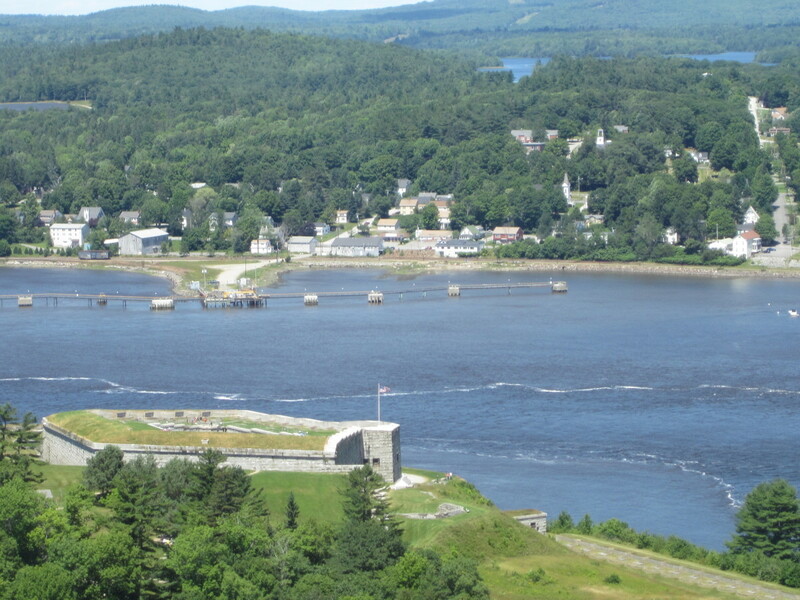 Next time you are visiting Maine and cross the bridge, stop and enjoy the views from the bridge and the observatory. 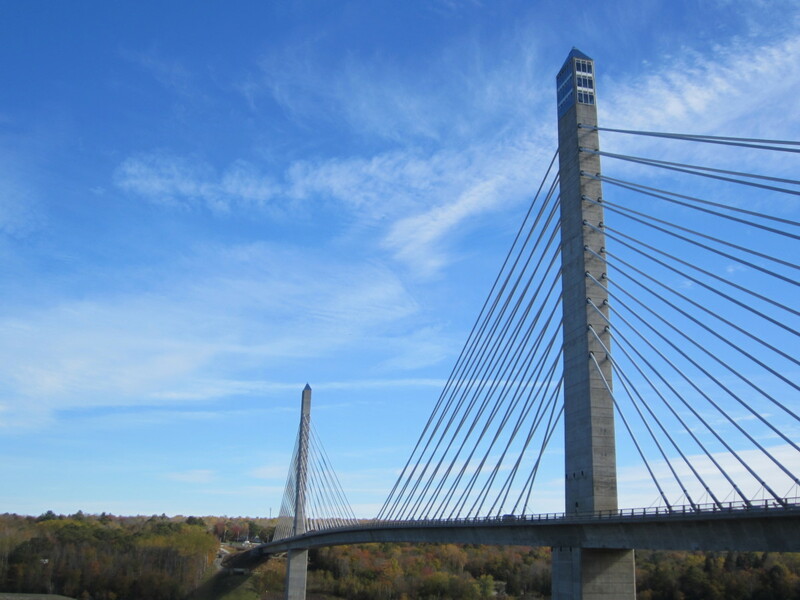 The Penobscot Narrows Bridge, a 2,120 foot stretch of US 1/SR 3, connects Verona Island and Downeast Maine with Prospect and Mid-coast Maine. 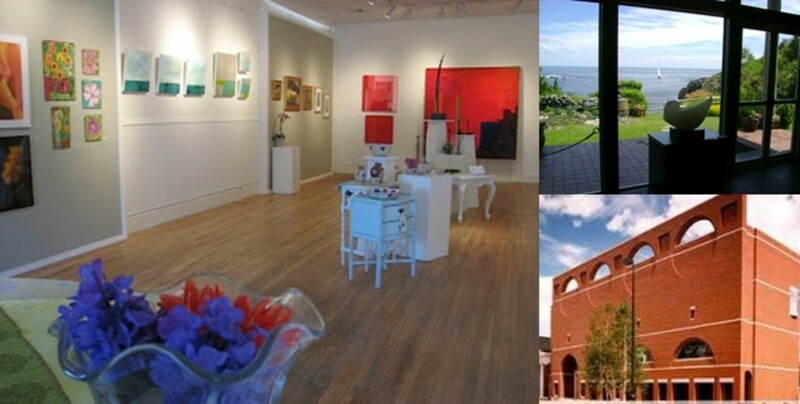 It is a frequently traveled route from points south to Bar Harbor and Acadia National Park. As you approach, the massive support towers catch your eye as they rise over 400 feet above the water. The western tower includes the Penobscot Narrows Observatory. 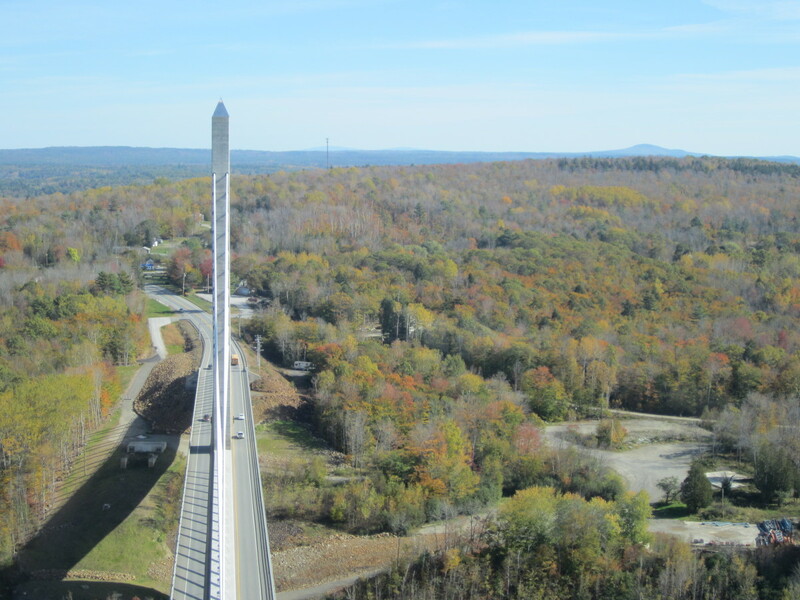 At 420 feet high, it is the first and only bridge observatory in the United States and the tallest public bridge observatory in the world. 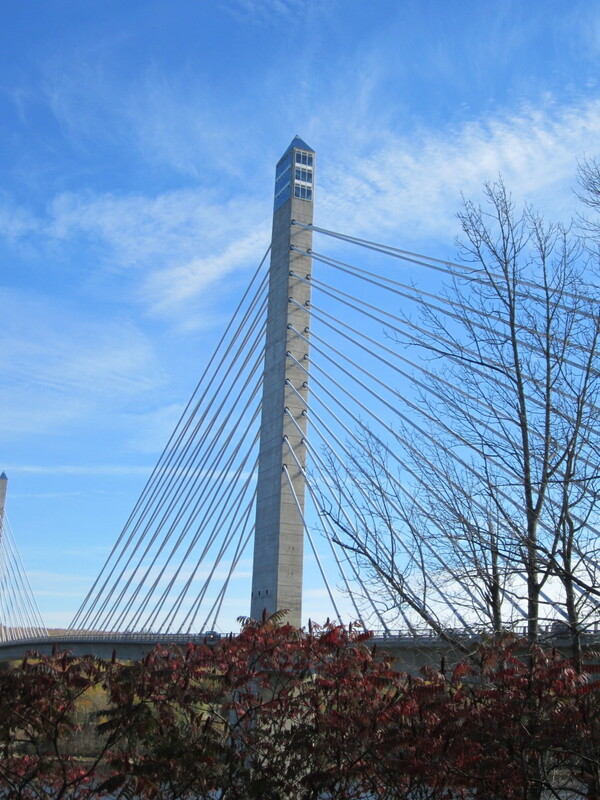 This cable-stayed bridge reminds travelers of the Washington Monument and it looks similar to the better recognized Leonard P. Zakim Bunker Hill Memorial Bridge over the Charles River in Boston, MA. The original Waldo-Hancock Bridge, built in 1931, was declared unsafe for truck traffic in 2003. All truck traffic on U.S. Route 1 had to be re-routed across bridges in Bangor. The detour, in addition to adding several miles and over an hour of time to the trip, increased truck traffic on Route 1A as well as in downtown Bangor and Brewer. 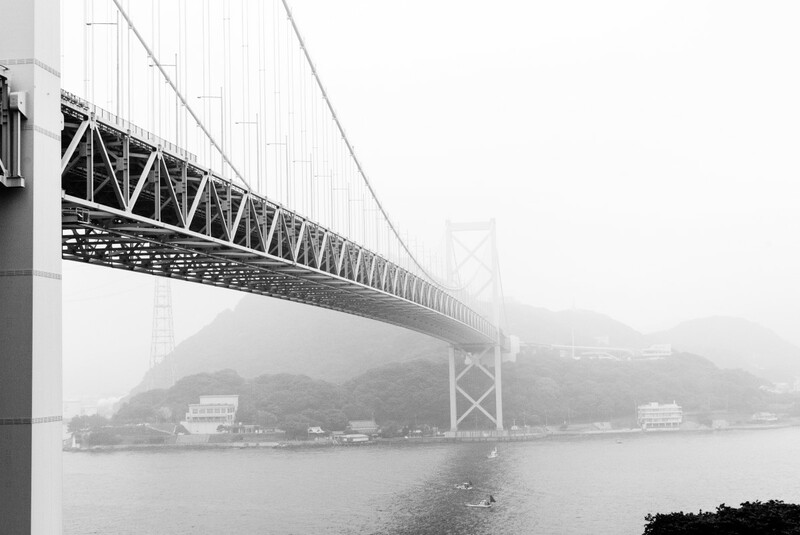 A sense of urgency demanded the old bridge be replaced as soon as possible, but no replacement was even planned. The new bridge was designed with community input to keep it in line with local architecture and not have it look like a new, modern structure. 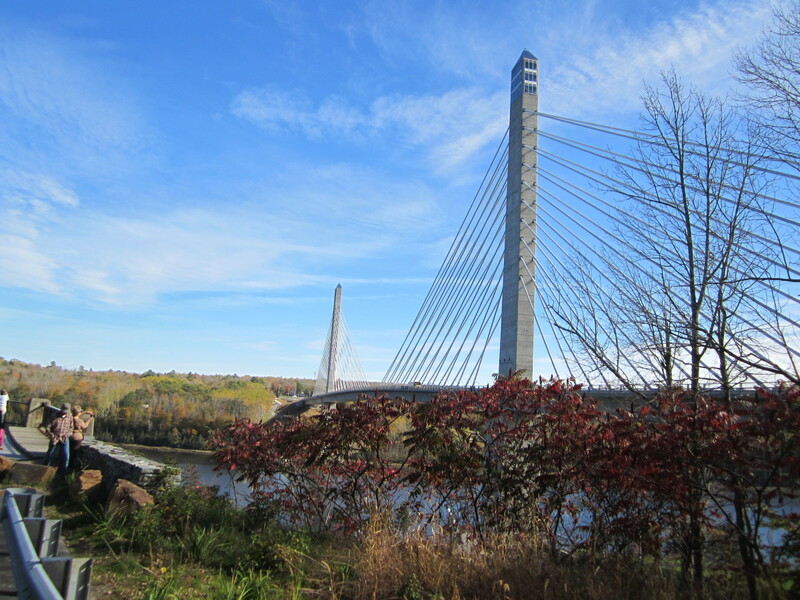 The design of the bridge utilizes a "granite" theme, a stone important to local and state economies. The fact that the obelisk shape of the support towers reminds viewers of the Washington Monument is not an accident. Some of the granite used to build the Washington Monument was quarried from nearby Mount Waldo. Like the observatory atop of the Washington Monument, the west pylon was also designed to have one as well. A timeless and rugged design to honor the importance of granite to the state as well as represent Maine and its people. 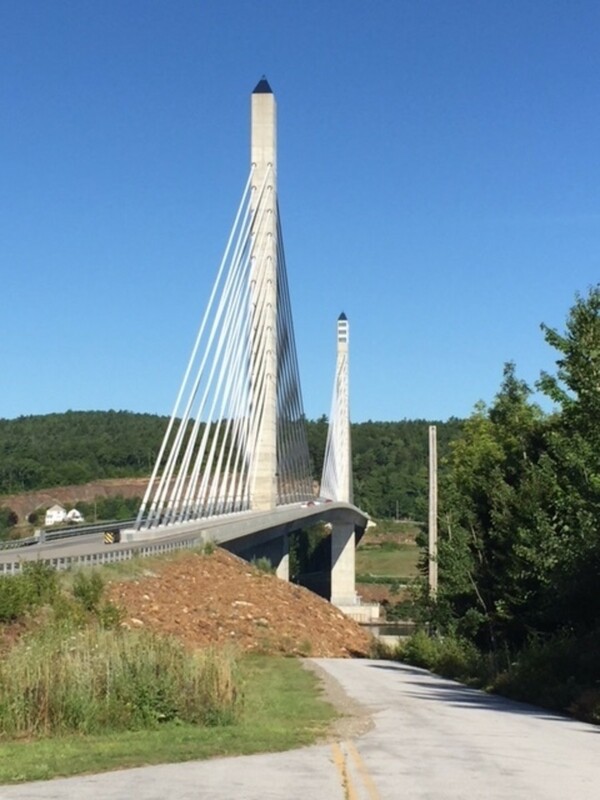 Using "owner-facilitated design-build", Maine Department of Transportation partnered with the designer, Figg Engineering Group, and the contractor, a joint venture between Cianbro Corp and Reed & Reed Inc. This cooperation allowed the foundation to be designed and built before the planning and design for the rest of the bridge was even completed. Utilizing a cable-stayed bridge design rather than the suspension design of the old bridge also contributed to speeding up construction. 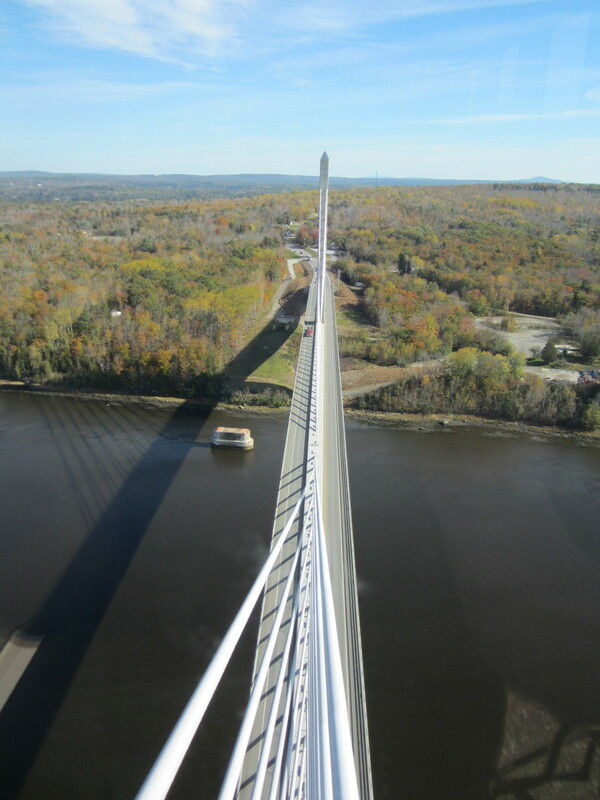 Using Maine granite and building bridge sections on site, it was only 42 months from the time the old bridge was declared unsafe to the time the new Penobscot Narrows Bridge was opened. 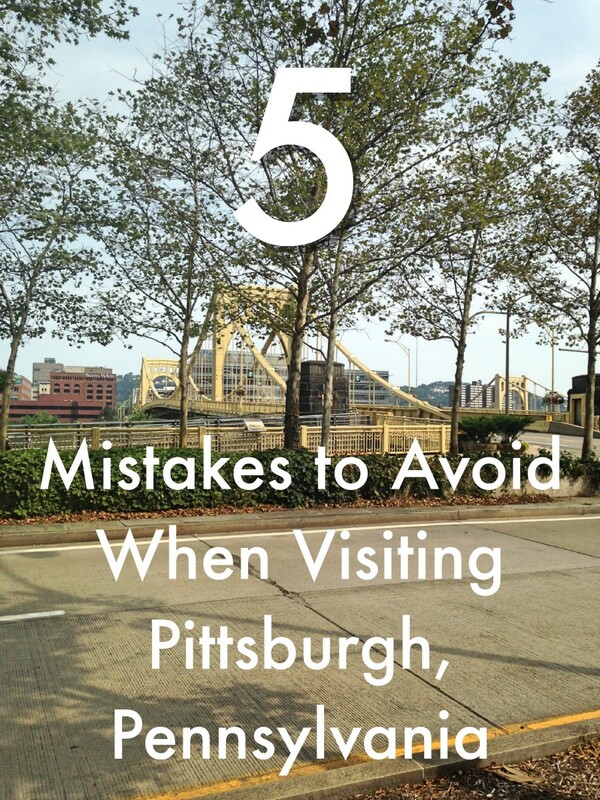 Concept, design, planning, permitting, and construction were completed in 3 and a half years and at a cost of $85 million. Quite a feat! At a height of 420 feet, the 2 floor observatory is taller than the Statue of Liberty and offers 360 degree views of the Penobscot River and Bay below as well as landmarks miles away. On clear days you can even see Mount Katadin. 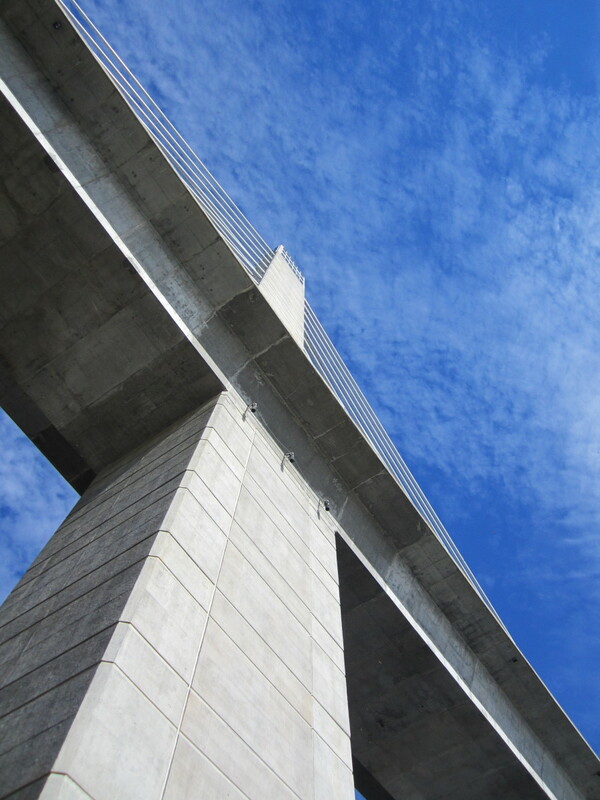 Enjoy the view and marvel at the engineering while driving across the bridge or , better yet, stop and spend a few minutes, a few hours, or even a day. The bridge is everything from a connection between two land masses to a destination. 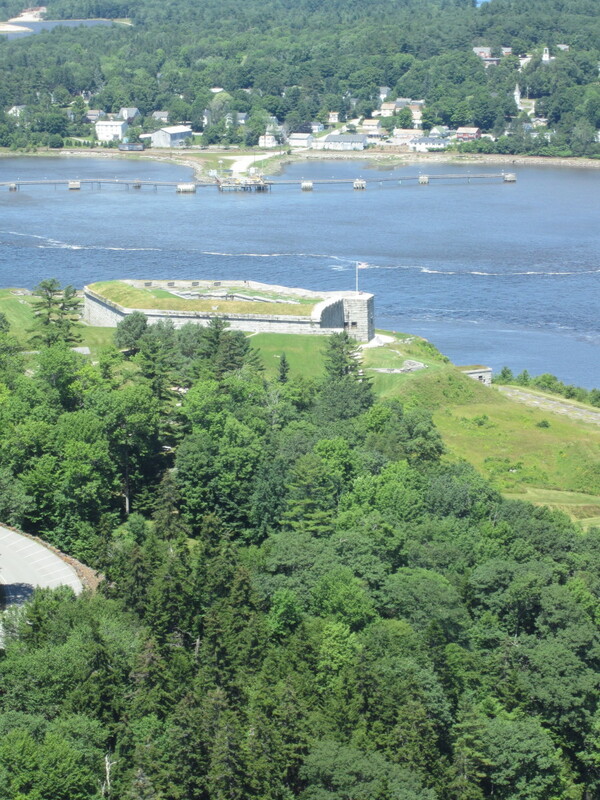 Combine a visit to the tallest occupied structure in the state of Maine with one to Fort Knox, Maine's largest historic fort. The site has a picnic area with grills as well as a covered pavilion for special events. Interpretive panels are scattered around the area and explain local wildlife and history as well as provide perspectives on transportation and natural history. The area is rich with countless backdrops for the perfect photo or selfie. Fort Knox is open 9AM to Sunset May 1st to October 31st. Children under age 4 are admitted free. 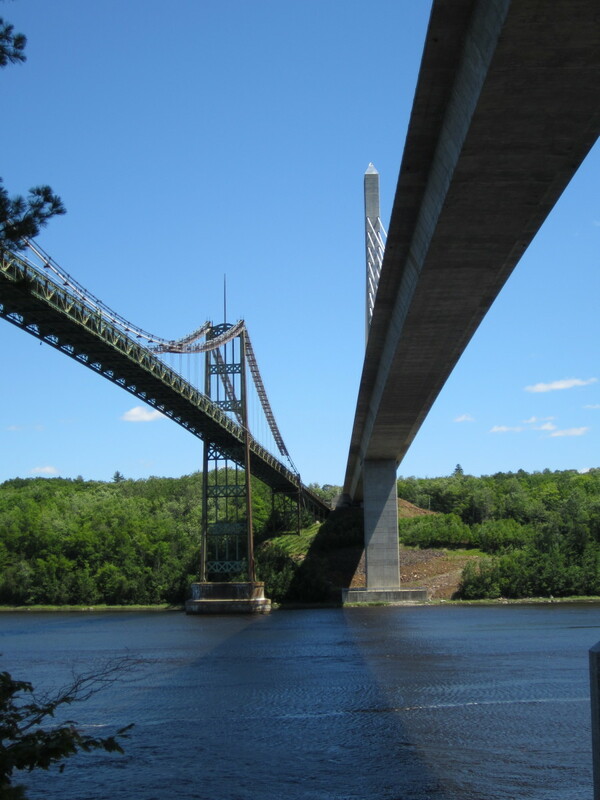 The Penobscot Narrows Bridge spans the Penobscot River as U.S. Route 1/S.R. 3 between Belfast, ME and Bucksport, ME. 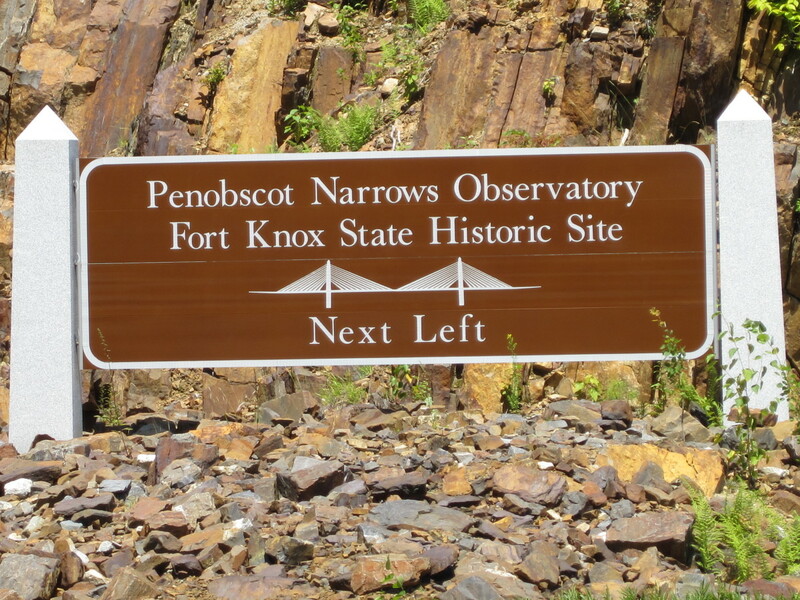 Visitors to the observatory enter through Fort Knox Historical Site just off Route 1 on S.R. 174 in Prospect, ME. Glad you enjoyed the article and pictures. When we are in Maine we try to slow down and appreciate its beauty. Glad you enjoyed the article. I love your comment about slowing down and appreciating the world around you. 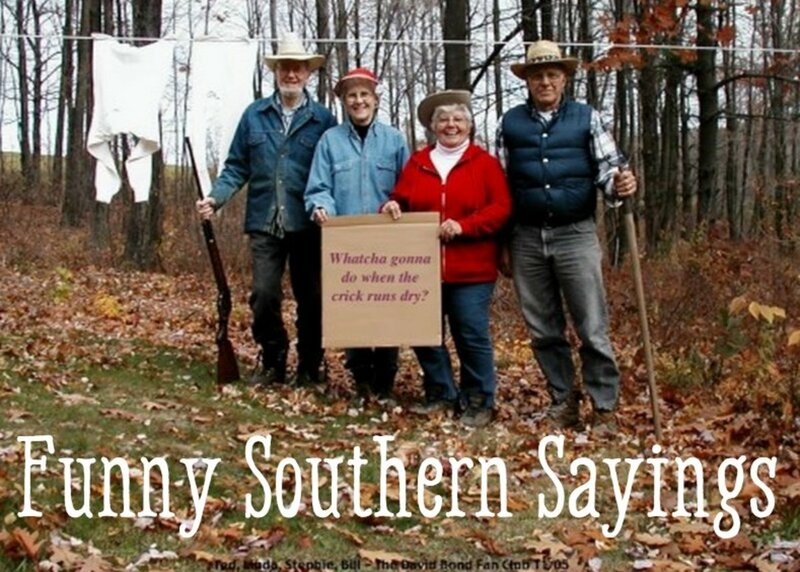 It would do us all good if we could fo this more often. 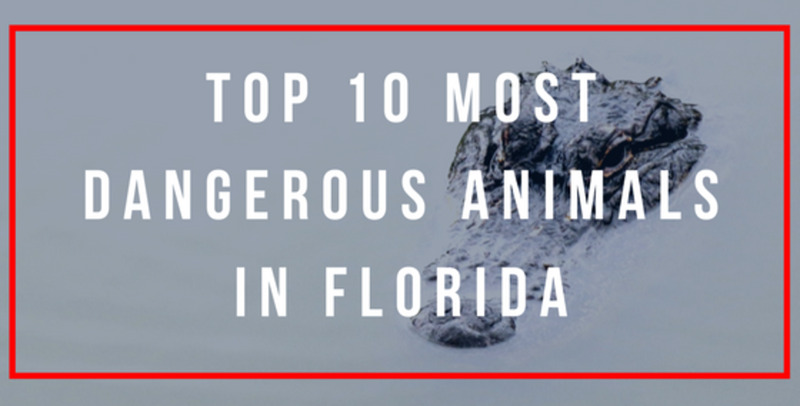 This is a very interesting and well-illustrated article.